Some people think life is not black and white. The life and teachings of the Church, however, are. We are either with Jesus Christ, or we against Him. We are either for Christ or anti-Christ. We either believe what God has revealed, or we reject it, and in rejecting or accepting what God has revealed, we reject or accept the God Who revealed it. The excitement of the National Catholic Reporter and its readers is palpable. No poll, no referendum, no survey, however, could possibly change or alter the Truth. Be on guard against every possible deception. 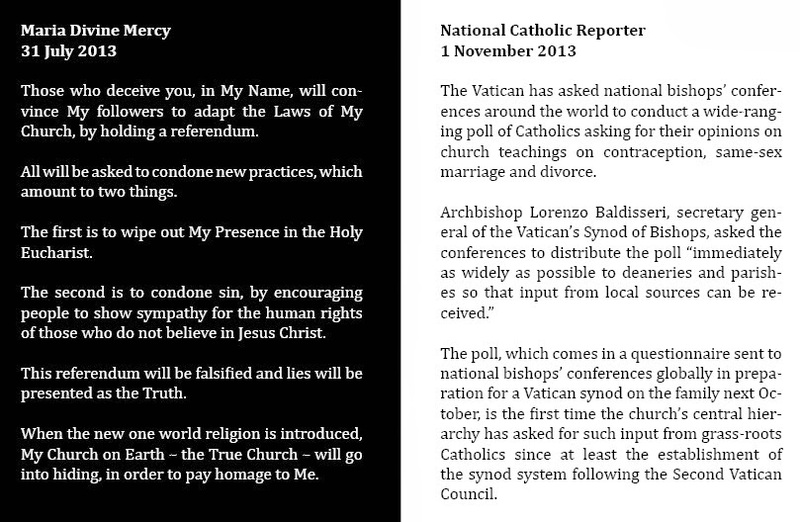 A survey seems so innocuous, but there are powerful forces at work in the Church that would like to exploit such an idea, not least at NCR, The Tablet and within liberal circles in the Hierarchy of Holy Church. 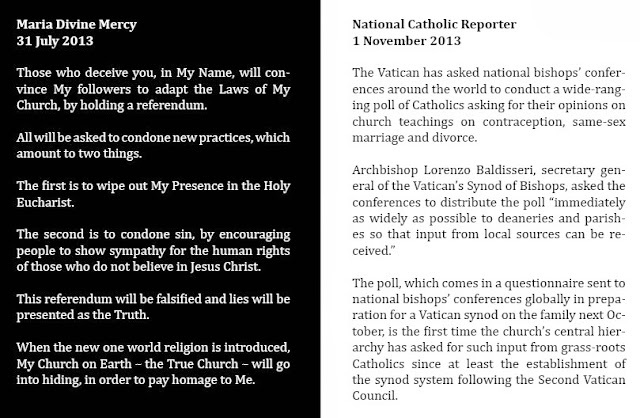 Let us pray that this survey will be treated as it is being presented - as a way of seeing how the Magisterium is 'received' and that its 'results' will not lead to anything that may weaken the holy doctrines of the Church, nor lead souls into error or confusion. As you can see I'm quite into polls myself at the moment and I'm happy to hear one person 'just emptied Purgatory'. Well done that person - an example to us all! Pray for the Pope, for the Bishops and for those who govern the Church in Rome. It never ceases to amaze me what „the Vatican” is able to perform if something is vitally needed. I´m looking forward to a survey about liturgical abuses in the Dioceses and parishes of the World . I think that website may have crashed ages ago. Most of the Catholics I know haven´t realized even until now that there is such a thing as a liturgical abuse. @Martina - "I'm looking forward to a survey about liturgical abuses in the Dioceses and parishes of the World". Perhaps someone should start one within the context of the Church in E&W, so that we may have some qualitative evidence of how widespread the irreverence and ignorance now is.